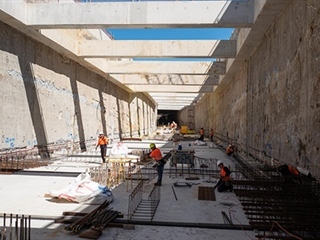 The Forrestfield-Airport Link crew takes you right into the heart of the Bayswater construction site with this update on the dive structure concrete pours (March 2019). At 16.5 hectares, our Forrestfield Station site is (literally) kind of a big deal. Let our very own anchorman, site engineer Simon, take you on a guided tour. 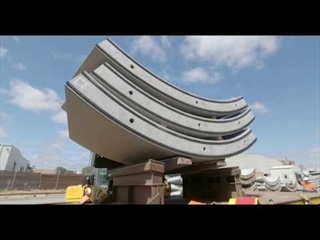 Approximately 9000 rings of concrete, made up of six tunnel segments each, are required to build the tunnels for the Forrestfield-Airport Link. The video provides an overview of the production process. 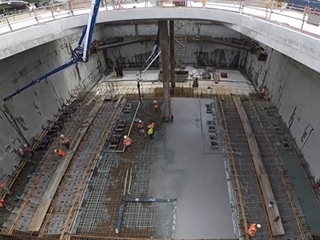 Concrete pours are underway at Bayswater Junction to construct the base slab of the 400m dive structure, where the tunnel boring machines will emerge at the end of their 8km underground journey. 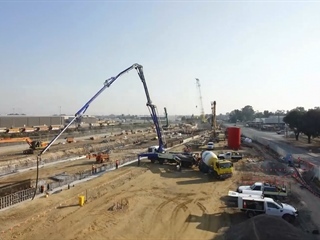 18 separate pours are required to construct the base slab, totalling more than 4000 cubic metres of concrete (January 2019). 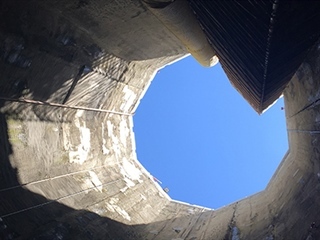 It takes 144 stairs to reach the bottom of the 36m-deep Airport West Emergency Egress Shaft (EES). This EES is one of three to be built along the Forrestfield-Airport Link alignment and, once complete, will provide access between both tunnels and to ground level for maintenance and in the event of an emergency (January 2019). Tunnel boring machine Grace reaches the halfway mark of tunnelling in November 2018 - a major milestone for the Forrestfield-Airport Link. 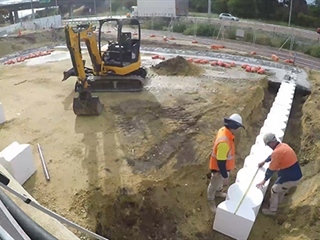 The large retaining wall built adjacent to Railway Parade to support the temporary Midland Line has been turned into a 500m piece of art thanks to PTA's Right Track program. 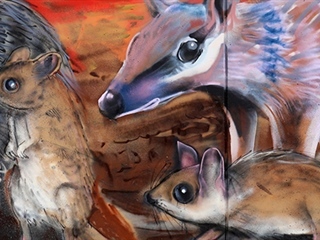 Perth urban artist Drew Straker, in conjunction with 75 up-and-coming junior artists, completed the work of art inspired by native animals and WA landscapes (September 2018). Redcliffe Station's base slab is taking shape with nine concrete pours, totalling 5500 cubic metres, scheduled as part of the construction of the 1.5m-deep station base (September 2018). 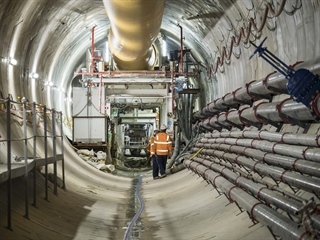 Tunnel Boring Machine Grace breaks through into the Airport Central Station box (May 8, 2018). 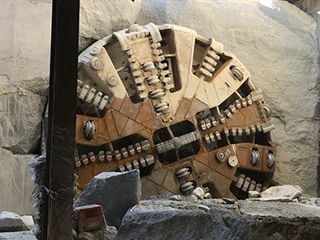 Tunnel Boring Machine Sandy breaks through into the Airport Central Station box (May 19, 2018). The Forrestfield dive structure, where the tunnel boring machines will launch from, is 260m long and up to 22m wide. It took seven months to build, but you can see how it was done in less than 70 seconds. Located at the junction of Brearley Avenue and Dunreath Drive, Redcliffe Station will offer a bus/train interchange designed to optimise travel times. When the station opens in 2021 passengers will have a 15 minute journey to the CBD. Located at the base of the control tower at Perth Airport’s Terminal 1, Airport Central Station will provide an 18 minute train journey to the CBD when it opens in 2021. A 400-tonne crane is onsite at Forrestfield to help assemble our first tunnel boring machine (TBM). It can be seen here lifting the two heaviest sections of the TBM, the 164 and 143 tonne shields, into position. 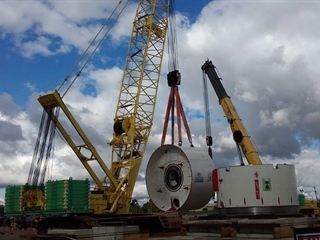 Key components of our 600 tonne tunnel boring machine have now been delivered to the Forrestfield site. 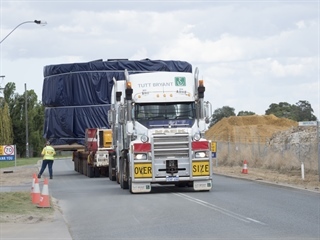 The $20m machine is one of two TBMs which will each dig 8km of 7m diameter tunnels from Forrestfield to Bayswater, with tunnelling due to begin later this year.